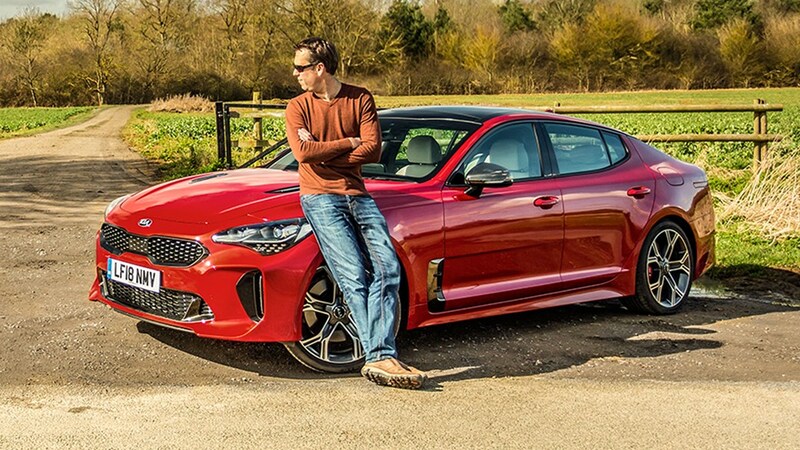 Driving over 1000 miles in a Kia would once have struck the fear of God into me, but I'm enjoying the Stinger GT S. The ride quality particularly impresses, with a supple, long-legged stride that more than delivers on the GT credentials Kia promises. The trade is body roll and a lack of ultimate focus, but all movements are nicely controlled. And because V6 Stingers get adaptive dampers as standard, you can quickly tighten up the body control. Front grip and rear traction are lower than the BMW 440i I'm handing back, but the Kia felt nicely balanced when I chucked it about for photos – it's length is an advantage in that regard. 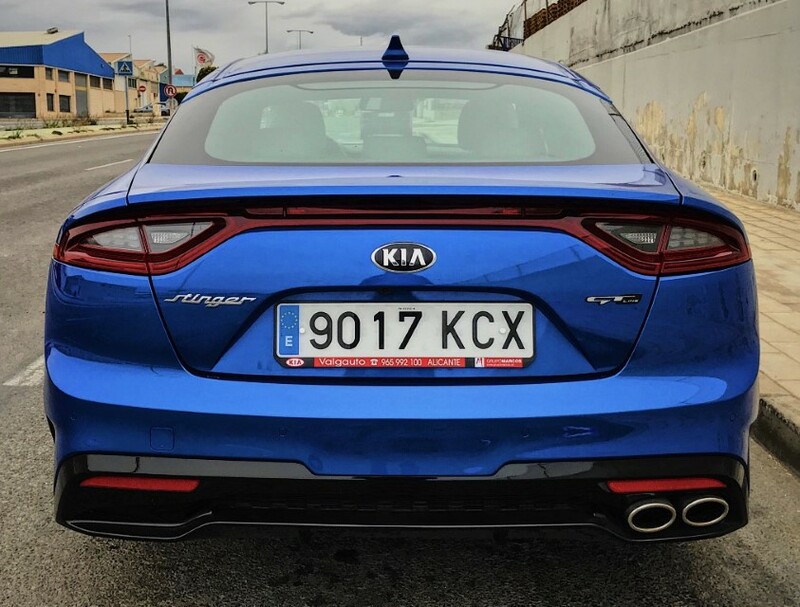 It's very much a road-optimised saloon, and quite right too, but I'm plotting a Nürburgring trip – I'll be fascinated to see how the Stinger copes with those crests and dips. Last month I mentioned Kia's official mpg figures were a way off the 440i (41.5mpg versus the Kia's 28.5mpg). So far, reality looks slightly better, with the BMW just sticking its neck out of 29mpg territory and the Kia almost reaching 24mpg. This suggests the Kia will cost over £500 extra in fuel every 10,000 miles, though – and need three services to the BMW's one – so fingers crossed the fuel economy improves as the V6 beds in. Month 1: is this the dawn of a new age? Just over a year ago, I was sitting inside a small hut on a frozen Swedish lake with Albert Biermann, Kia and Hyundai's head of vehicle testing and high-performance development. 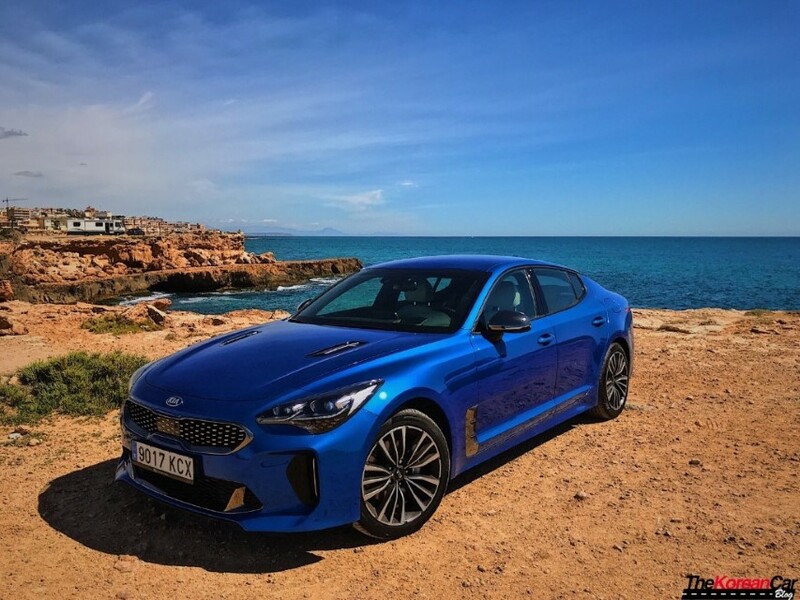 We were about to slide a prototype of the new Kia Stinger GT S around on the ice, and Biermann – poached from BMW's M division in 2014 – explained that the Stinger had been benchmarked against the BMW 340i. He did, however. 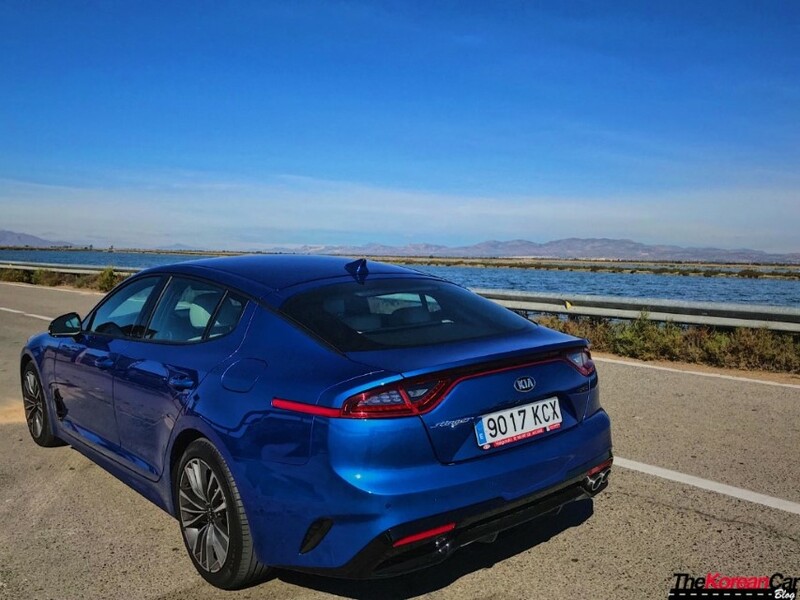 concede that the 440i Gran Coupe was more relevant because the Kia, too, is a 'five-door fastback' – the facelifted 440i wasn't on the market during Stinger development, but the 340i was. Anyway, a year later I'm considerably warmer, about to hand back a 440i Gran Coupe after over 9000 miles, and have just taken delivery of a new Stinger GT S. That's a pretty sound bit of context, I reckon, ahead of running Kia's first high-performance rear-wheel-drive saloon to land in the UK. 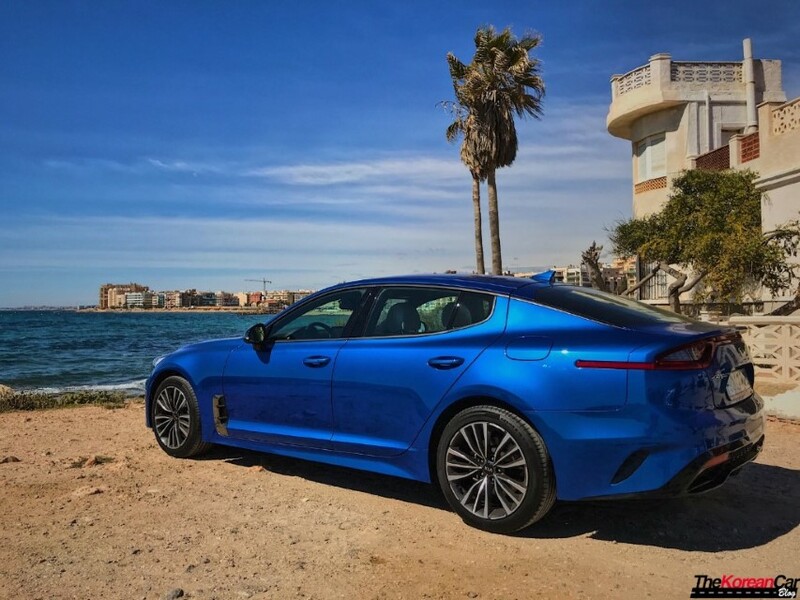 The Stinger is not a completely clean sheet for Kia: the platform is derived from the (Hyundai) Genesis G70 and Kia K9, models that aren't sold in the UK. It comprises 55 per cent high-strength steels, with a pretty unusual combination of MacPherson front suspension and five-link, double-wishbone rear suspension. Kia claims 'the Stinger exceeds all competitors' for crash-worthiness. You can get sensible versions of the Stinger, with both four-cylinder turbocharged petrol and diesels available. 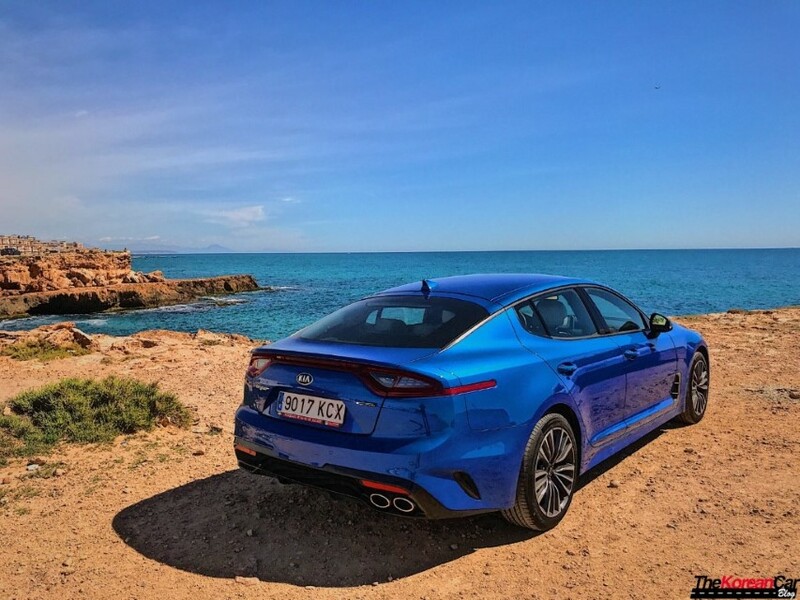 We've gone for the mad GT S version, which will sell in tiny numbers in the UK – Kia hopes to shift 1800 Stingers of all types in 2018, with the GT S accounting for perhaps 400 of those units. The idea of one person a day buying a GT S seems optimistic, but it'll be a pleasant surprise if they do. If the badge struggles to divert your attention from the default German triumvirate, the spec sheet might: a 3.3-litre twin-turbocharged V6 produces 360bhp and 376lb ft, enough for a 4.9sec 0-62mph dash and 168mph top speed (BMW 440i: 322bhp, 332lb ft, 5.1sec, and a limited 155mph top end). The Stinger GT S is also 190mm longer at 4830mm and with a 95mm longer wheelbase (the boot, though generous, is 74 litres smaller at 406 litres). The strong mechanical specification continues with four-piston Brembo brakes, adaptive dampers, 19-inch alloys, a limited-slip diff and eight-speed auto as standard. In fact, standard equipment is generous throughout, as it needs to be when it's up against premium German competition. It includes adaptive LED headlights with auto full-beam, rain-sensing wipers, front and rear parking sensors, nappa leather heated/ventilated eight-way adjustable memory front seats, rear heated seats, electric steering column adjustment, heated steering wheel, keyless entry and start, head-up display, sat-nav with traffic updates, reversing camera, 15-speaker Harman Kardon stereo system, DAB radio, Bluetooth with music streaming and a very large sunroof. Phew. All this costs from £40,535, with our test car increasing that to the maximum possible £41,180 courtesy of the 'Premium' red paint. That's not a huge saving over the £45,490 440i Gran Coupe (but note that our 440i is optioned to £57,605). Without wishing to spoil the suspense, after a few early miles I reckon the Stinger is a pretty fantastic drive, and I'll have the space to explain why soon. 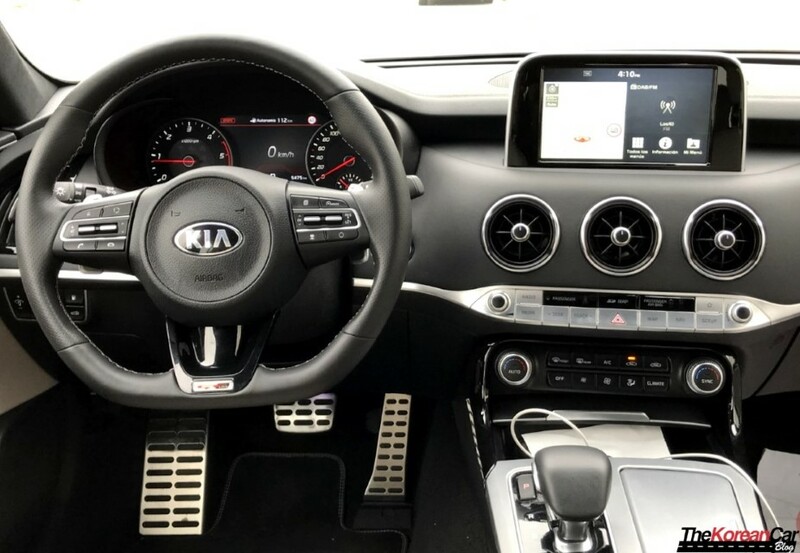 But there could also be a sting in the tail to this loan: Kia is quick to shout about its incredible seven-year/100,000-mile warranty, but all petrol models require a service every 6000 miles or six months, and fuel efficiency of 28.5mpg and 225g/km is a lunar-mission from the BMW's 41.5mpg and 159g/km. At 1855kg, the Stinger is also 165kg chunkier than the BMW. Will these downsides cause the Stinger's downfall in regular use? A long-term test provides the perfect chance to find out. 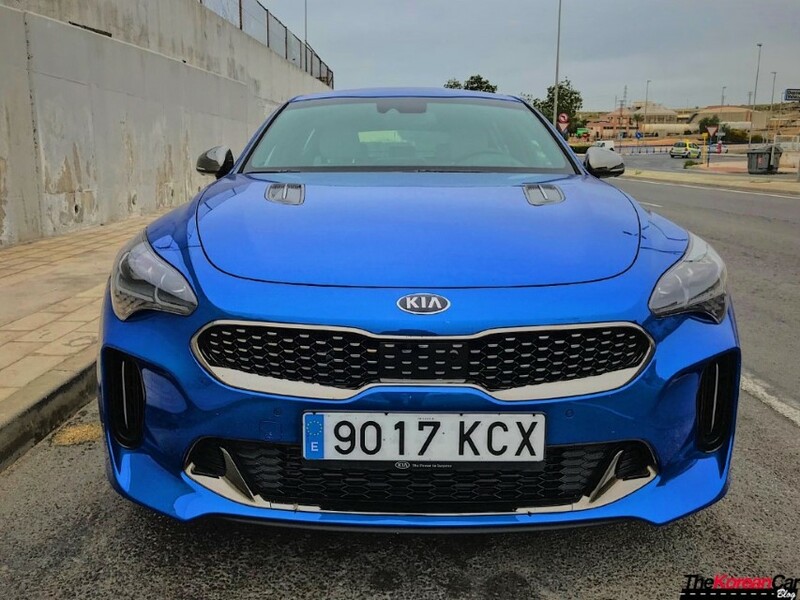 KIA Stinger GT 4 seconds 0 to 60!!! So close to breaking that sub 4 second barrier!!!! We did this on factory tires, at 45 psi and the killer thing about it, no launch control (trying to avoid wheel spin). This thing is crazy!!! We are at 12.5 seconds to 120 MPH, so just a little more tuning and we should have the car running 120 MPH in the 1/4 mile. Please follow the page for updates and check out the website over at damnfastdd.com for the parts you need for your KIA Stinger!!! First KIA Stinger GT into the 11's in the 1/4 mile! LAP3 R&D isn't finished yet. There's more to come! Join LAP3 Performance page to see more! 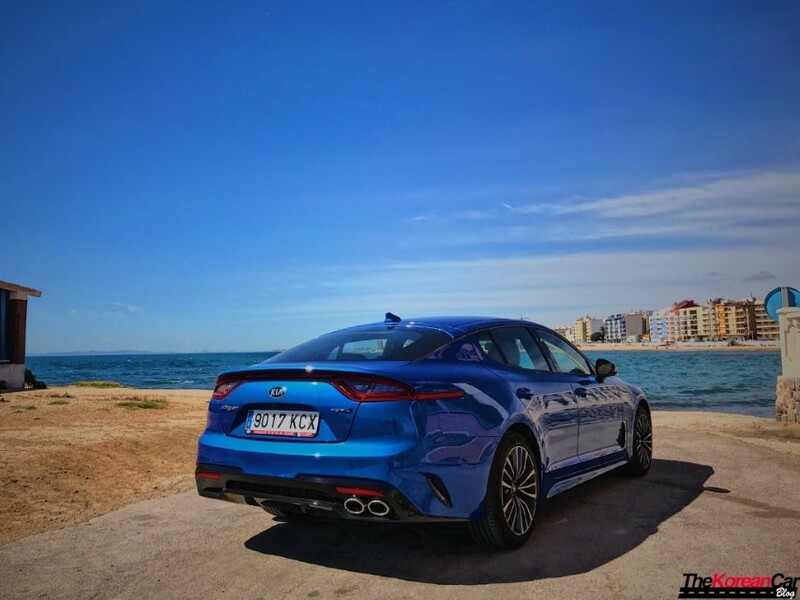 There are 3 new parts available from Agency Power for the Kia Stinger GT and these are ones you absolutely must have! 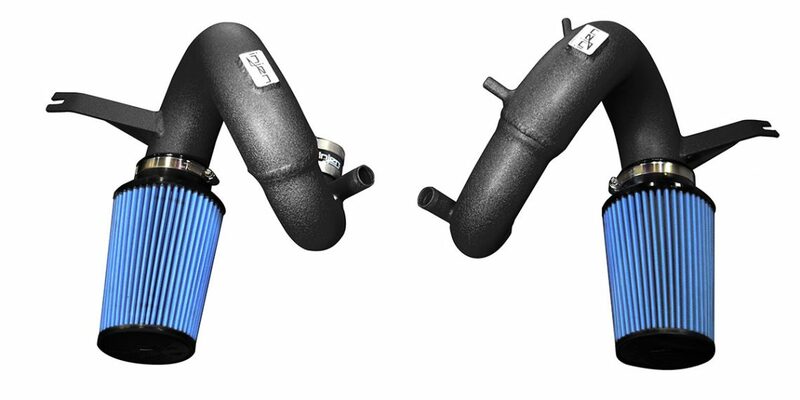 Besides an exhaust system (Agency Power's version to be released soon), we show off these Upgrade products that include the Air Intakes, Intercooler, and Blow Off Valves. Each one of these parts definitely has a purpose. With 370 horsepower from the factory, improving efficiency and keeping the twin turbo setup running at its peak is extremely important. 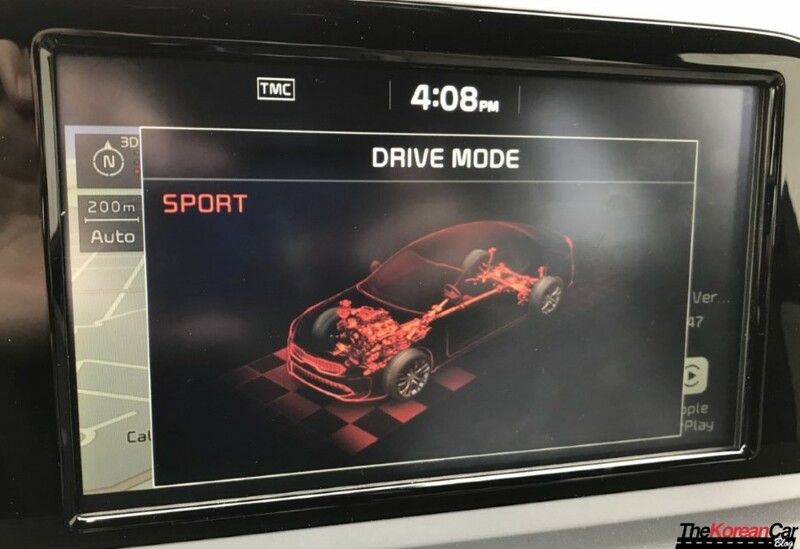 KIA Stinger GT Tune revisions... we need better tires! This is just some of the pulls we attempted to do on the street, and get some "dragy" results, and lets be honest with each other.... unless you have an AWD car, getting "dragy" times to match with track times is going to be a very difficult. We simply have way to much wheel spin on the street to successfully pull off a decent 1/4 mile time with the "dragy" software that someone keeps mentioning. Track prep is a needed evil when you have a RWD car. Now, that doesn't mean we will not have a good set of drag radials on the car soon, and hopefully start pulling some sub 4 second 0 to 60 times. If you watch the video... you will see exactly what I am talking about. This new tune, destroy's the tires all the way into 3rd gear and we had a few 4th gear OMG's when we were testing. Who's ready for some Stinger throttle response tuning from RaceChip? 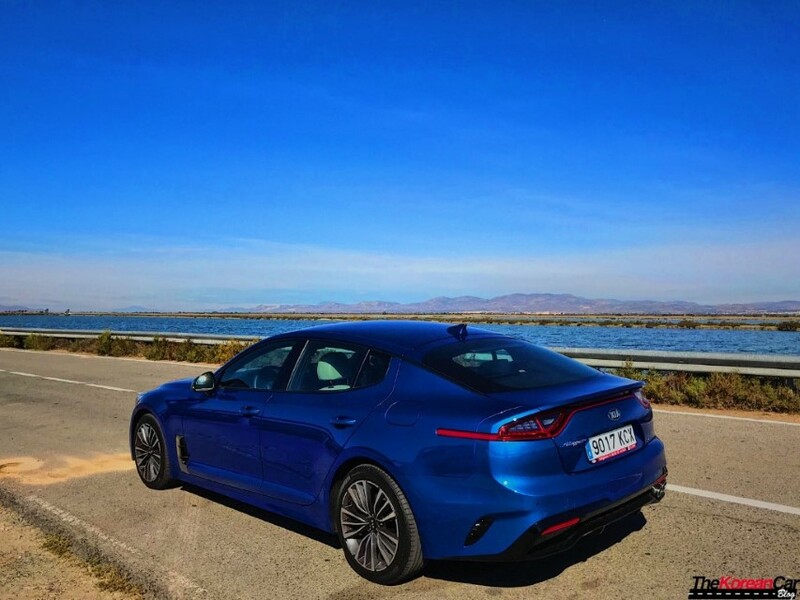 It’s no secret that the Kia Stinger GT is a disruptive car in the high-performance sedan market. It has all the right ingredients to fight with the best of the best, and even stand toe to toe with the class leader, the BMW M3, in some situations. Unfortunately, it lacks as far as horsepower compared to the class leaders. Thanks to the turbocharged nature of the Stinger GT, however, getting more power from it is pretty easy. By letting more air get to the turbochargers, more air can be compressed into the engine, and with the addition of more fuel, the engine makes more power. This is the whole idea behind a cold air intake. 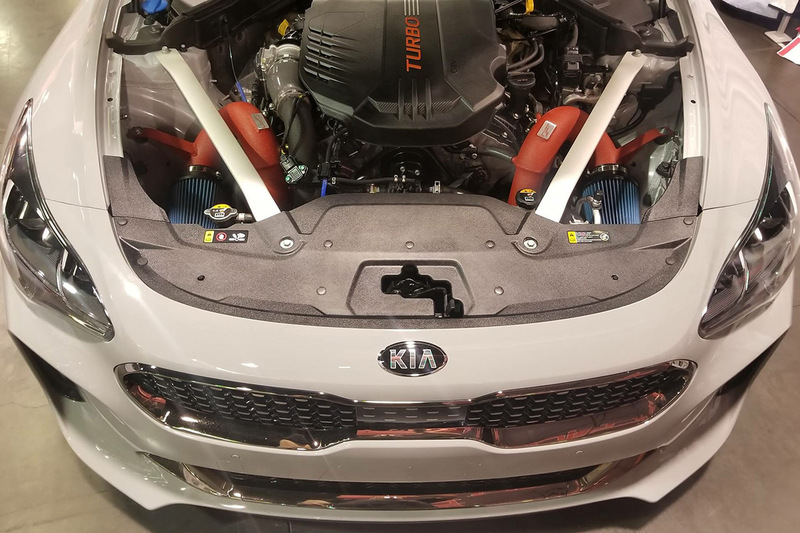 Injen, one of the largest cold air intake manufacturers in the world, has just announced their new cold air intakes for the 3.3L Kia Stinger GT. 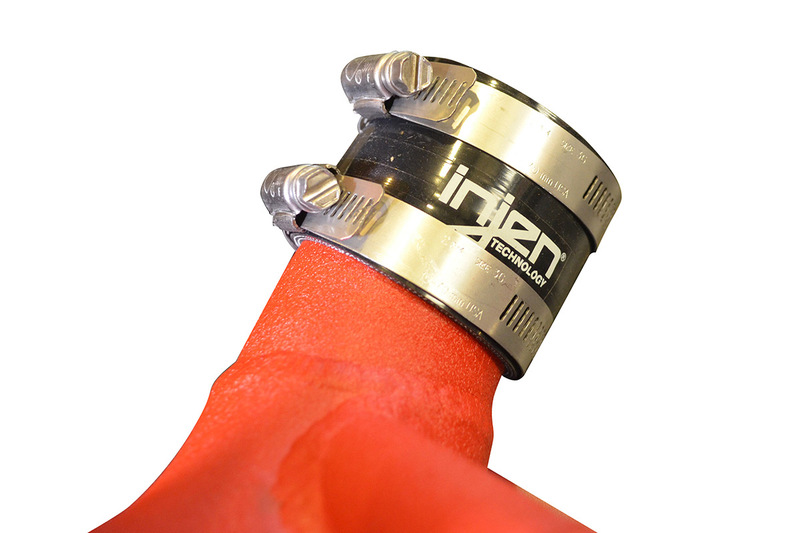 The kit uses two reusable Injen SuperNan-Web Dry Air Filters which not only provide excellent airflow but great filtration. The kit was designed as a direct OEM replacement, meaning there is no cutting, welding, or any custom work involved. 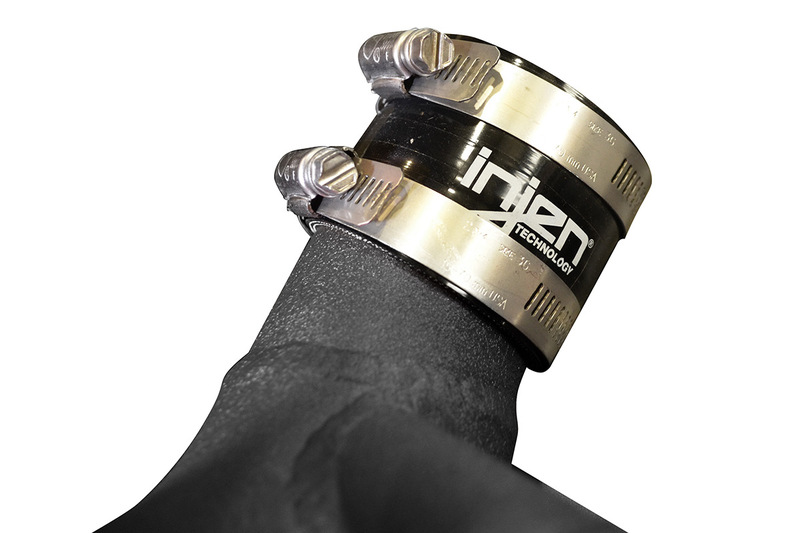 Simply unbolt the stock intakes and bolt in the Injen intake. As we mentioned above, increased airflow allows for more power. In this case, the Injen intake adds an impressive 20 horsepower and 17 ft-lbs of torque! 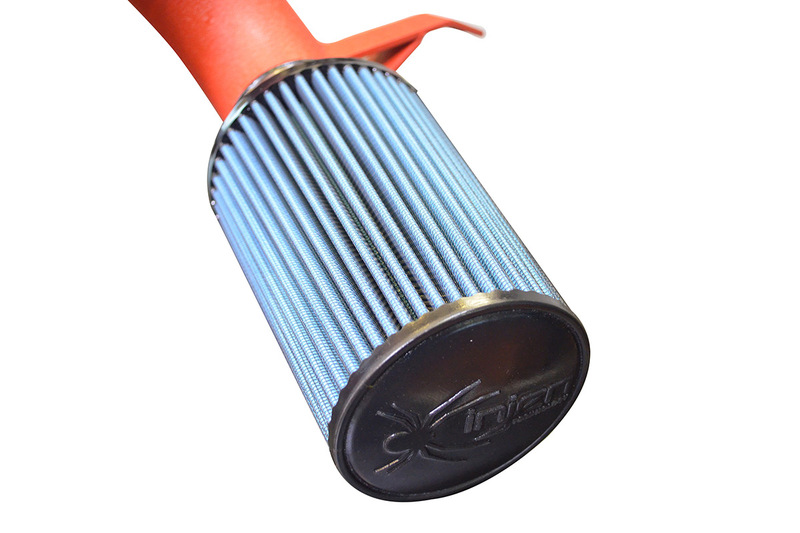 If you have any questions about the Injen Intake for Kia Stinger GT, please do not hesitate to contact us. We can be reached by phone at 1.480.966.3040 or via email at sales@vividracing.com. Thank you Timon for this amazing opportunity! Did he say 750 ftlbs of torque??? 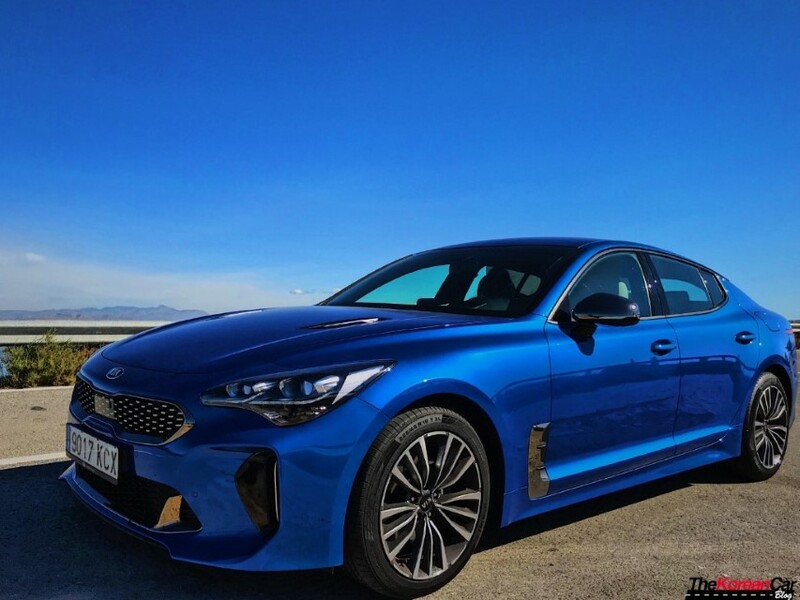 WHAT WE LIKE: If we had to sum up the Kia Stinger in a single word, that word would be progress. Because, more than anything else, that's what this four-door grand tourer represents. Progress in quality. Progress in execution. And progress in boldness. Boldness is required to build a car like the Stinger. It doesn't quite fit perfectly into any predefined segment—it's not really a luxury sedan, and it's not completely a sports sedan. Technically, it isn't even a sedan at all—it is a big four-door hatchback GT car with ample power and comfort. And it doesn't embarrass itself in moderately hard driving, either. That's progress. 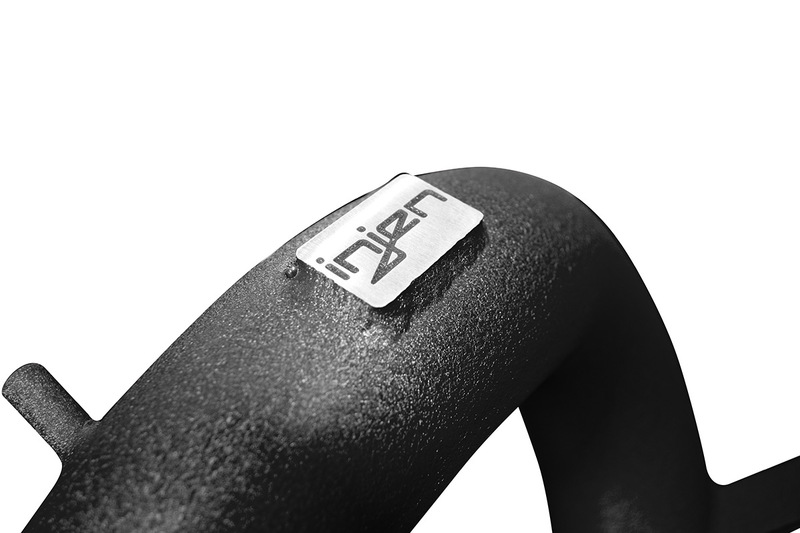 But beyond the step forward the Stinger represents for the brand, it's also a pleasure to live with. Comfortable, quick, and easy to use, it's an excellent high-velocity road-trip companion. Associate online editor Joseph Capparella might have put it best in his logbook entry: "I love this car. 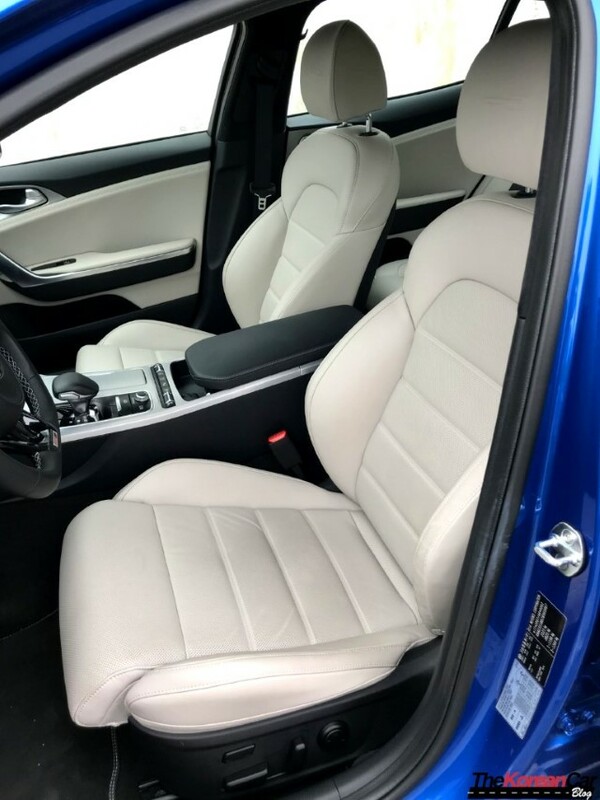 It's a quick, refined, elegant, and stylish grand tourer that cruises effortlessly at high speeds while offering tons of space for both people and cargo." At our prompting, Kia delivered a set of summer tires for our all-wheel-drive Stinger GT—an OE set of 19-inch Michelin Pilot Sport 4 rubber—which improved its performance in both instrumented testing and in daily use. Acceleration remains largely the same, with 60 mph arriving in 4.6 seconds rather than 4.7. The quarter-mile time, at 13.2 seconds, didn’t change, but both roadholding (0.89 g versus 0.85) and 70-mph-to-zero braking (170 feet versus 179) were measurably better. Happily, the transmission-overheat warning we experienced almost immediately in our first trip to the track remained at bay this time until our last few runs. The Stinger's on-road performance gives no indication that its transmission is heat sensitive, which leads us to believe this isn't a problem that will crop up in even the most grueling on-road duty cycle. WHAT WE DON’T LIKE: Remarkably few negative comments color the Stinger's logbook. One editor disapproved of the graining on the center of the steering wheel—a nit if we've ever found one to pick—and several of us noticed that the touchscreen is a long, awkward reach from the driver's seat. Removing and replacing the all-season tires has largely eliminated any grumbles about dry-weather performance, although the empirical improvements aren't as great as some had hoped. WHAT WENT WRONG: Aside from the aforementioned transmission-overheat warning, which resolved itself when the track beating subsided, exactly zero mechanical issues have plagued our Stinger. We've changed the oil twice to date—the first visit included a cabin air-filter replacement, and both included inspections—for a total of $162. WHERE WE WENT: Here's the thing about the Midwest that left and right coasters might miss: It's pretty close to Kentucky and West Virginia, both of which offer a surfeit of driving roads, many of which are well suited to the Stinger's smooth-but-fast corner-slaying abilities. Interstate 77 through West Virginia offers just the right balance of speed and twist to appreciate the Stinger's talents. The Stinger made the trip to our annual Lightning Lap track battle at Virginia International Raceway and has also made several additional trips to Kentucky and Ohio. Sweetening all its miles is our Stinger's 22-mpg observed fuel economy, 1 mpg better than the EPA combined estimate. That's a stupid add-on for any car. After a few years of rumors, reports, spy pictures, etc. Kia finally launched a production version of this GT concept car, and named as Stinger. 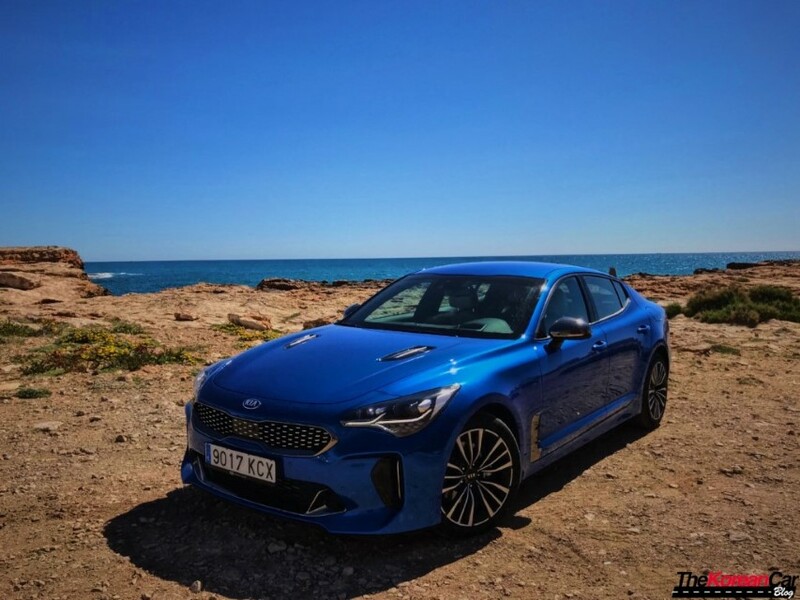 As the most powerful Kia car ever, the Stinger turned into the “halo-car” from South Korean brand, offering among others, the same engine that was showcased on the GT Concept Car, at this time with a final output of 370 hp and RWD/AWD options. The Stinger range offers also, in Europe, two additional engines, a 2.0-liter Turbo GDi with 255 hp and a Diesel engine, that uses a revised 2.2 CRDi R-Engine with 200 hp. All engines are matted to a in-house 8-speed automatic transmission. 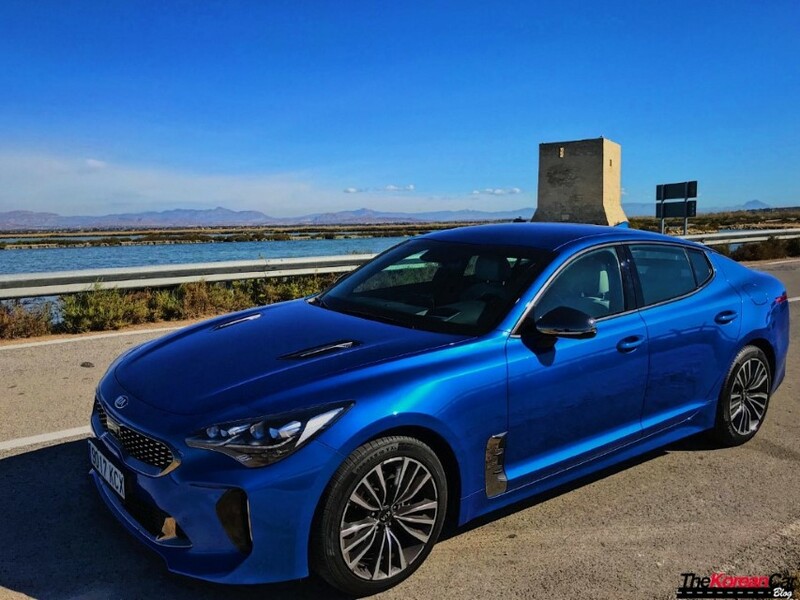 The Kia Stinger 2.2 CRDi we have tested was a GT-Line unit, which is the top version despite the GT variant which is only available for the 3.3 Twin Turbo that we will test soon. 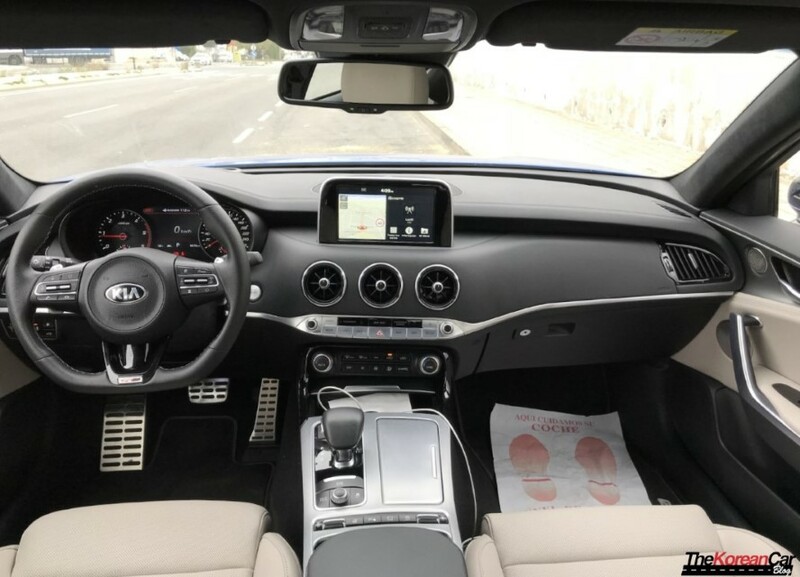 Kia is doing a great job with this car, I’m sure that everyone who see this car and try, even with the diesel variant, will be very surprised due to its sporty design, interior quality and driving dynamics. From the exterior, where it looks agressive and wider with the front & side air intakes, to the interior where it looks elegant, covered by leather, solid adjustments, the plane-inspired air vents or the two tone ambient. 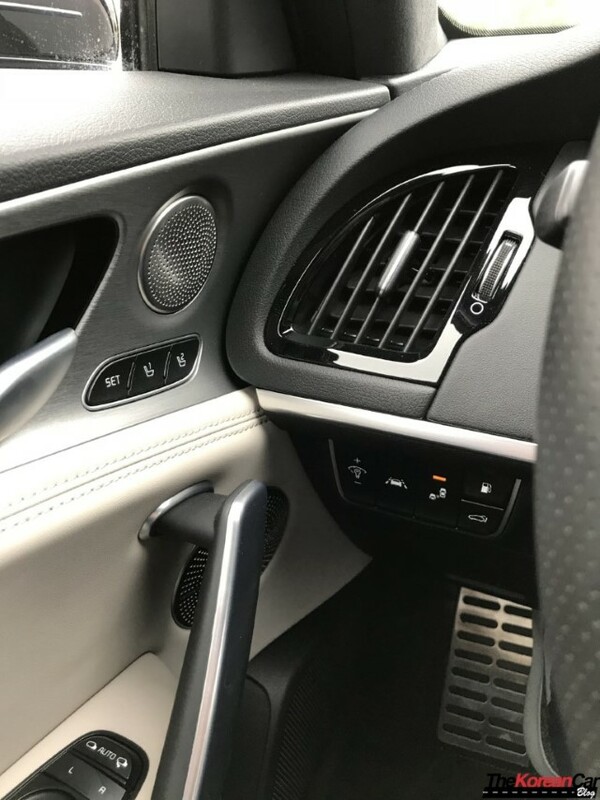 Inside, the body posture while driving is perfect, it can be configured practically to the liking of each driver, electrical settings from the steering wheel, seats, etc. Visibility is a good point, until you try to look back, but at the end you have a lot of sensors like the 360º camera, the rear cross traffic alert and blind spot detection so you will not suffer that much. At the time you were inside the Stinger GT-Line trim, you will definitely fell like you’re in a luxury car. 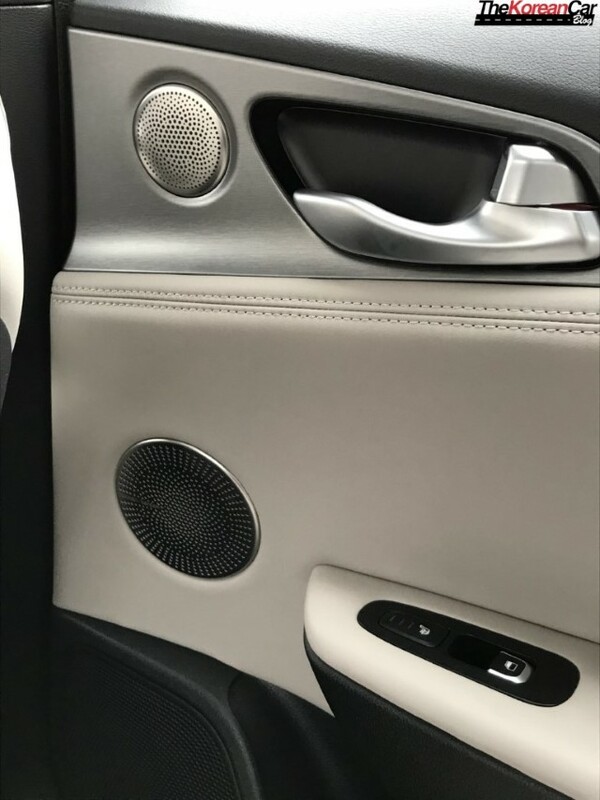 The cabin is dominated by nice-to-touch materials that are both soft and tactile, with real metal touches and a very sturdy build. Going in and out from the car is a little bit difficult due to the car is low as well as has a lower roofline, specially at the rear seats. 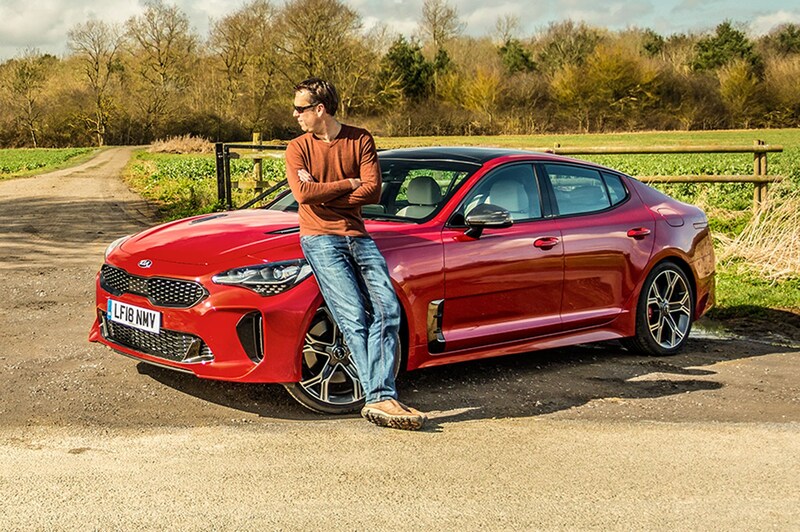 But the best thing of the Kia Stinger, despite the design and price, is the driving dynamics. According to Kia, this car was developed and tuned with the BMW 4-series on the horizon. 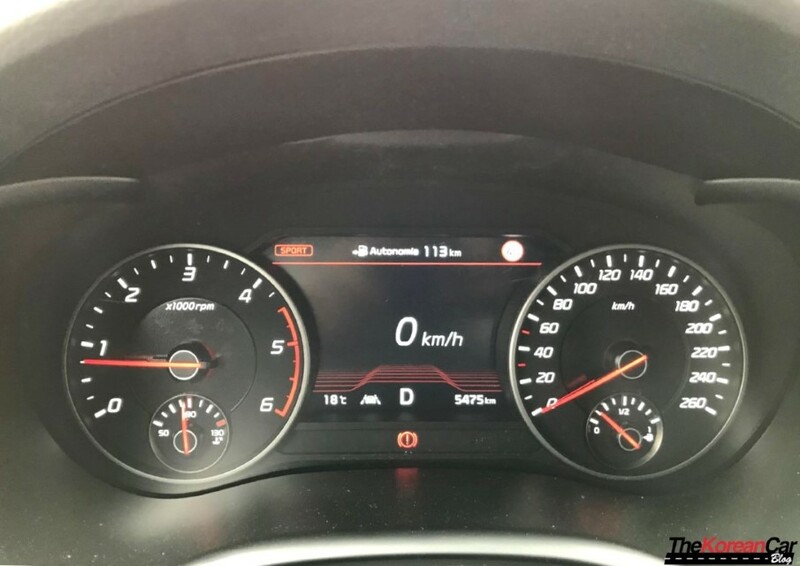 The head of this tuning was Albert Biermann, ex-BMW M Performance Chief and after you take your seat and start driving, you feel the difference. 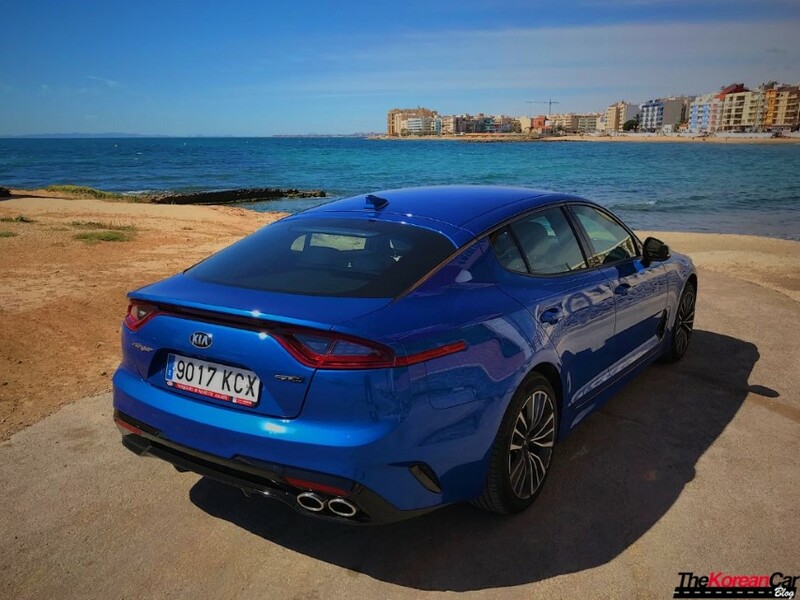 Despite the lenght (4,83 m) and the weight (1,778 kg) the car shows a very agile response but it does not feature the clever tech that makes its more potent sibling impressively nimble given the Stinger’s size, but the diesel version still changes direction sweetly, we mention the adaptive dampers of the V6 engine, so changing between Comfort, Sport and Sport+ drive modes doesn’t do anything to change the manner in which this car rides. However, the Sport+ setting will add weight to the steering and pare down the traction control, as well as increase the amount of synthesised engine noise that’s pumped into the cabin via the Stinger’s Active Sound System. We found that we left the Stinger in Comfort for the majority of our time with it, if only because this powertrain doesn’t particularly inspire you to drive with the enthusiasm that the petrol models do. Overall, the handling experience of the Stinger diesel all-wheel drive is sporty, but it’s definitely more of a cruiser than a corner devourer, for that we might recommend you the V6 with RWD that we will be testing in a few weeks. Special thanks to Valgauto Motor who left us the car for this test drive. 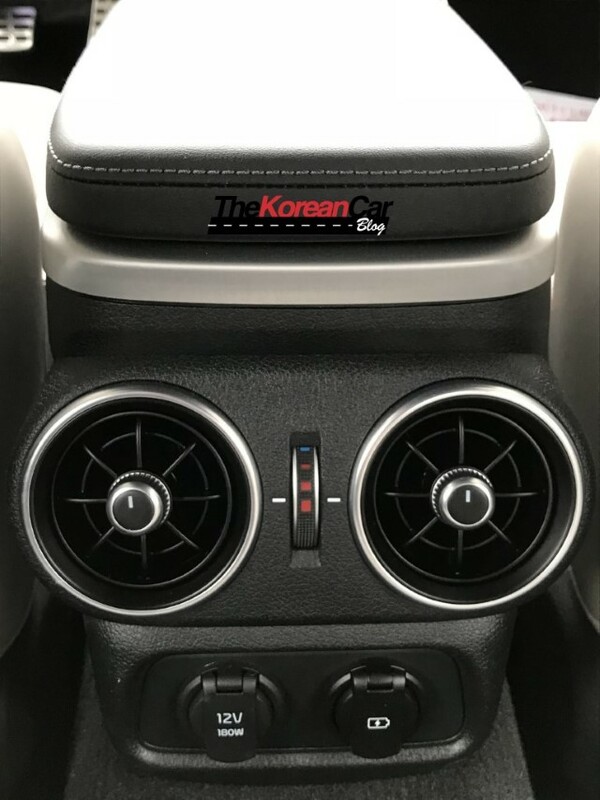 TurboKits.com Kia Stinger Turbo Upgrades on the way to Korea for final test and tune! RESULTS. Okay guys, we ran the car with the new downpipes at the track. It improved a full second over where it was at before. Previously the AWD GT2 ran a 13.7 @ 101 in the 1/4 at a density altitude of 8,600ft. It now ran a 12.75 @ 109.6 at a density altitude of 8,900ft . Which would equal out to this being an 11 second car at sea level! These results are with a mild tune. We are excited to run it again after we finally up the boost! 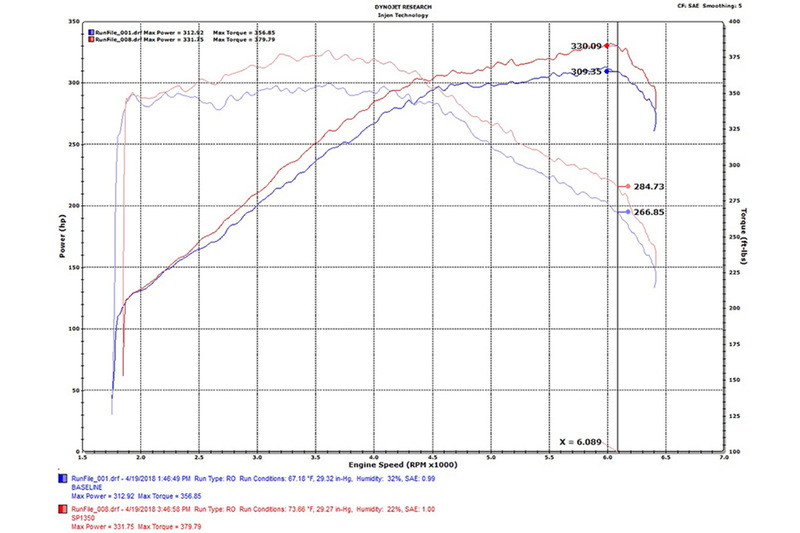 Dyno results will be coming in the next few weeks as well!